The Alpha Tau Omega Fraternity at UAH will be hosting their annual car show benefiting cancer research at the Russel Hill Cancer Foundation. All proceeds go to the foundation. Registration is $20, starting at 10AM on the day of the event. If you would like to simply donate to our cause, please visit www.russelhill.org to donate via online. Click on the 'Donate' button under the headline "ATO Auto Emporium." Thank you in advance for any help you can give us. Alpha Tau Omega is hosting its 8th annual car show to benefit the Russel Hill Cancer foundation. 100% of proceeds are donated to the foundation. I know a lot of you have some amazing cars so come out and show them at the car show to benefit cancer research! This is all for a great cause. The entry fee is $20 a the gate and registration starts at 10 A.M. If you are in a car club or bring a large group out you can get a discount on the entry fee. This event will be judged by MECA and there will be trophies given out for 1st, 2nd, and 3rd in eight different categories. Door prizes will also be given out throughout the day. Please come out ans show your cars for this great cause! If you need any extra details definitely shoot me an email. A cold day affected the turnout of this event, but there were still plenty of cars to look at. Austin from Red Baron Photography was covering the event, so be sure to check out the full gallery of his coverage. Any additional details about the car show? This year's Alpha Tau Omega Car Show benefiting the Russel Hill Cancer Foundation is on November 6th. Registration starts at 10:00 AM and will close at 11:30 AM. 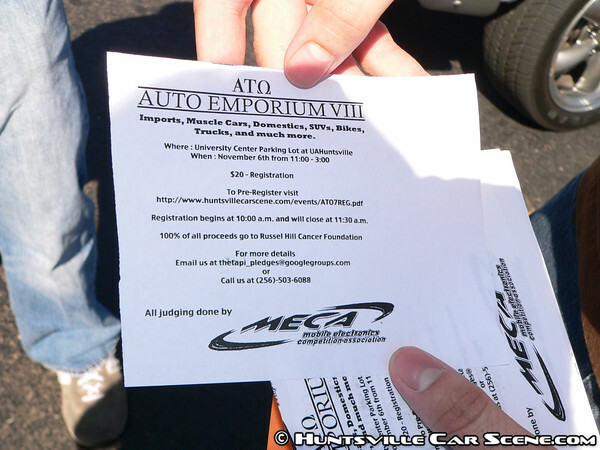 A $20 registration fee is required for each car. All of the proceeds will go to the Russel Hill Cancer Foundation. All judging will be done by MECA and there will be 8 categories! Be there to help raise money for cancer research and to have a great time with family and friends! should be awesome this year! Not to mention there will be hot college girls there! As well as door prizes. This is one thing I forgot to mention at the meeting. If you can invite some friends that want to take pictures with the cars, that always keeps things lively. The Alpha Tau Omega is once again hosting a car show at UAH in the parking lot of the UC. There is a 20 dollar registration fee to participate in the car show. Registration will begin at 10:00 a.m. and close at 11:30 a.m. All proceeds will be donated to the Russel Hill Cancer Foundation. All cars and bikes are welcome! there will be some hot girls there ready to arrest you next to your car...all the more reason to show up...plus the more cars the more chances for a shot in a magizine. plus chances are you will walk away with more than $20 in door prizes so my car will deff be in there. I'll prolly ride by and check this out if it's not to cold out.......I think the highs are only in the low 50's for saturday. Yikes! You're right. It will be cold. You've been staying on top of the weather, that's for sure, lol. Like I've got time for that. I wake up and go straight to work, stopping only for protein drinks so I don't have to eat. Heck, I haven't even showered in two days. I'm washing the mazduh this morning. Expect me to drop by. I didn't even wake up in time for any of the events I was planning on hitting. I was completely exhausted. I didn't even fully recover until today. And now I'll be back to working long hours to finish catching up. No shower today, lol. It's going to be another 100hr+ week. Awesome show. hope more from HCS will come out next year! A lot of people from HCS came out, but not enough people really knew about it. Flyer promotion needs to be done at least two months in advance at every event listed on the HCS calendar. While a large number of people check out the site each month, even more are offline and only find out about events via flyers. I agree with you. Cold weather didn't help either!